The legend of the Radler dates back nearly a century to post World War I Germany, when an innkeeper named Franz Xaver Kugler, opened a tavern and tried to capitalize on the newest craze of bicycling by working to have a bike path built right to his establishment. On the day thousands of bicyclist showed up demanding a beer, Kugler realized he would not have enough. He quickly remembered a stash of lemon soda he had, cut it 50/50 with his beer supply, and saved the day and gave birth to a legend. Radlers can be confusing. In German, Radler means: Cyclist AND it also means: Bier-mixed-with-Soda. 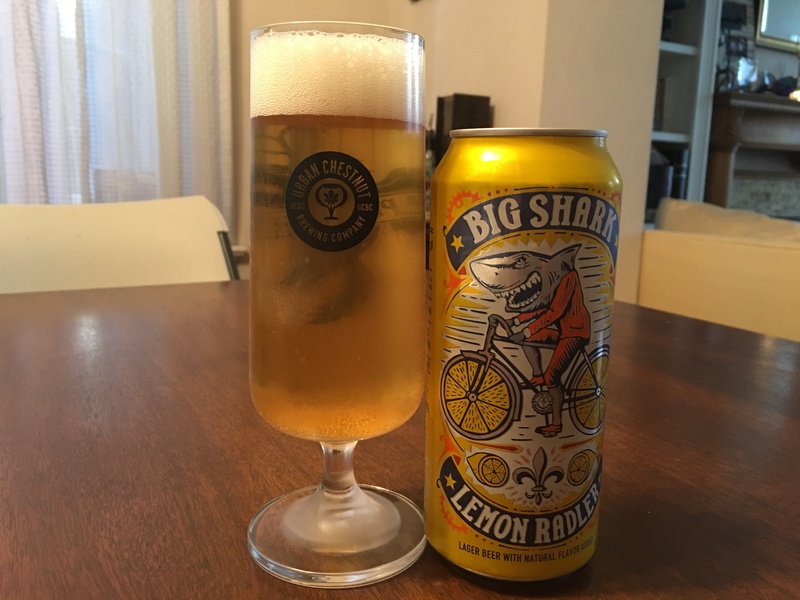 So of course when UCBC went about canning our first Radler, we got things a little mixed-up with our friends at Big Shark Bicycle Co., and found ourselves “cranking out” a Radler/Radler mash-up, i.e… Big Shark Lemon Radler. Which naturally turned out to be a refreshing Lemon-flavored Bier – the ideal libation for that post – (or non-) cycling occasion. Prost! — Urban Chestnut Brewing Co. from the back of the 16 oz. wide mouth can! To honor Kugler and his invention, UCBC combined their flagship Zwickel, an unfiltered, unpasteurized German classic, with lemon-lime soda. This sort of holy union has produced a beer that frankly is designed for bikers. Behold, the Big Shark Lemon Radler. Now, nearly a year later Urban Chestnut Brewing is releasing the first variant of this perfect summer, biking beer. 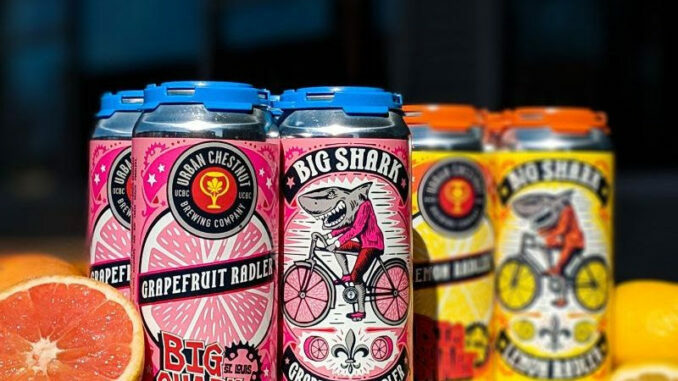 Big Shark Grapefruit Radler is a crushable (4.2% ABV | 10 IBUs) blend of grapefruit soda and Pale Lager with an initial, noticeable sweetness and a bright finish. An overall easy-drinking, thirst quenching beverage. On the nose, the beer explodes with a burst of grapefruit but sits back and on your first sip, you’ll get all the wonderfulness of the pure Zwickel lager and the no-nonsense of the grapefruit soda. The soda isn’t hidden here, it isn’t folded underneath and it doesn’t disappear quickly. It is like you poured a grapefruit soda into a lager, and if that isn’t your thing, then this isn’t for you. But what you’re really looking for in this beer, no matter if you’re popping the wide mouth top off the 16 oz can during a ride or after cutting the grass, is a cooling, crushable beer that is designed for refreshment. And that is what you’ll get. This is a beer designed for fun, so have fun with it. Float trips, backyard barbeques, tailgating before a ballgame, this is a beer that will create good times, with good friends, so enjoy!